Married to a Desi: Ahhh Austin! Ahhhh Austin. Live Music Capital of America. 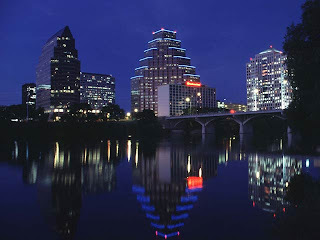 I like Austin a lot, I visited my husband a few times when he lived there. I dont' recommend it in July (WARNING: HOT) when the evenings are beautiful but stay indoors during the day! My favourite part (note Canadian spelling) of Austin is the Tex-Mex food. My all time list topper is Freebirds where I have had the best burrito EVER. And it's only 7 bucks for EVERYTHING. They have several different kinds of salsa, and beans, and tortillas, and on and on. Plus they have cool motorocycles hanging from the ceiling. Must go there if you are in Austin. Next on the list is Chuy's, its second to Freebirds because it is not as cheap (it's still cheap generally speaking though). It is also a sit down and get served type place as opposed to Freebirds fast food atmosphere. Chuy's has a crazy diner filled with vintage elvis era memorabilia, and they have the BEST salsa (WARNING: HOT). The food is so good, but I recommend their Texas Martini. Yup, its a margarita, the best margarita you will every have, with an olive in it. Or two. And there is a limit of two Texas Martini's per customer because they are that POTENT. And we're talking about Texas where they sell beer at the gas station. Another great spot is the Alamo Drafthouse Theatre, where you can order beer and food and watch a movie at the same time. Its great they come and serve you while the movie is going on. Loved it. Plus there is a lot of nice sight seeing in Texas. Honestly one of the most enjoyable excursions I was taken on in Austin was to Whole Foods (they are actually an Austin based company). It is quite the experience there - maybe I'm biased because my husband took me there and we had fun buying all kinds of different ingredients and then he made me dinner. OK, i hope you get the same treatment from your significant other when you go to Whole Foods. I had a great time listening to live music in Austin, of course. We caught some amazing bluegrass at a place called the Saxon Pub. I'd never seen anything quite like it, especially the people who get up and dance. It's a true hoedown in every sense. I especially like the fiddle players, they were truly good musicians. In general, places in Texas are far apart from each other. They love their land there. So be prepared to drive a lot. Enjoy! I will post some pictures of my Austin trip here soon. Enjoyed reading about your experience in Austin, TX. I am of Indian-subcontinent origin (30 year old Finance professional)contemplating moving to Austin to escape severe winters. Your review is very encouraging, thanks.